Milwaukee, Coho! In or out it’s all good! Coho and Chinook Report 5/25/2016 Salmon are hot! Join us in Milwaukee! To get my fish reports and how to videos first go to http://www.jimhirt.com By subscribing you will keep ahead of the other anglers. When I post you will get it fast! It was mostly a spoon bite for Chinooks with Coho on flies. The pattern hasn’t changed. Coho are filling the box with limits possible. The big Chinooks are also in. Chinook are coming on small or magnum size spoons. Reapers and Vulcans made by http://www.badgertackle.com have been working for us. The small silver Vulcan in green or blue has been hot on the downriggers. Run them 50 feet behind the ball 45 feet down to the bottom. Six inch flashers or dodgers with green or blue Howie’s peanut flies also caught fish. Tie your flies 14.5 inches on 6 inch dodgers, 16 inches for 6 inch flashers. All orange dodgers and flashers. I hope this helps. Slide Diver are producing with flies set at 3 no ring 40 feet of line out. For all fish speed has been very critical with the warmer 51 degree water. I use the Depth Raider to measure speed at the ball. The Chinook are hitting Reaper Magnum Glow spoons at first light and blue or green with silver back all day. The boat speed of 2.2 to 2.4 has been best. The faster speed triggered the Chinook action. Fish are hanging in close to shore or 125 to 200 feet. We did not get out over 200 feet of water yesterday. Head straight out to 125 or fish inside of 50 feet. Have a great fishing season. Let’s go fishing! Note All alone we put together groups at $125 per person. Jim charters out of Milwaukee, WI. with Blue Max Charters. He can be reached at 414-828-1094 or visit his web site at http://www.bluemaxcharters.com Copyright© 2016, James J. Hirt, All Rights Reserved. Milwaukee, Shallow water is stacked with Hungry Coho! 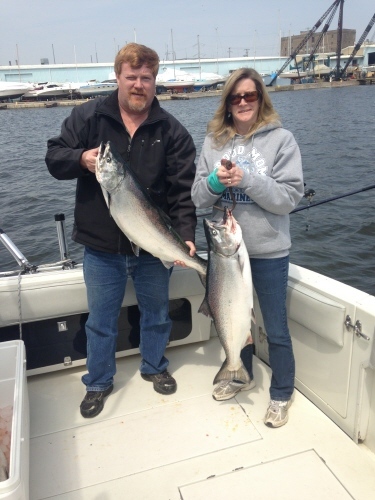 Coho and Chinook Report 5/15/2016 Salmon are here! Join us in Milwaukee! To get my fish reports and how to videos first go to http://www.jimhirt.com By subscribing you will keep ahead of the other anglers. When I post you will get it fast! Great fishing morning for the Scherbarth bachelor party ! We had a great time. It was mostly a spoon bite with a few fish on flies. The pattern hasn’t changed. Coho are filling the box with limits possible. The big Chinooks are also in. Chinook are coming on small or magnum size spoons. Reapers and Vulcans made by http://www.badgertackle.com have been working for us. The small silver Vulcan in green or blue has been hot on the downriggers. Run them 50 feet behind the ball 15 feet down to the bottom. Six inch flashers or dodgers with green or blue Howie’s peanut flies also caught fish. Tie your flies 14.5 inches on 6 inch dodgers, 24 inches for 6 inch flashers. All orange dodgers and flashers. I hope this helps. Slide Diver are producing with flies set at 3 no ring 35 feet of line out. Fish are hanging in close to shore or the break wall. We did not get out over 50 feet of water yesterday. Follow the shoreline working 40 feet of water. Have a great fishing season. Let’s go fishing! Note All alone we put together groups at $125 per person. Jim charters out of Milwaukee, WI. with Blue Max Charters. He can be reached at 414-828-1094 or visit his web site at http://www.bluemaxcharters.com Copyright© 2016, James J. Hirt, All Rights Reserved. 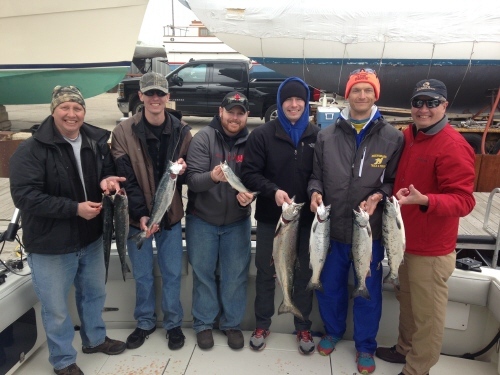 Best Chinook fishing of the Season! To get my fish reports and how to videos first go to http://www.jimhirt.com By subscribing you will keep ahead of the other anglers. When I post you will get it fast! Russ and Carol Drew got a work out with screaming Kings! We had a great time. It was a all spoon bite. The pattern hasn’t changed but the big Chinooks are in. Chinook are coming on small or magnum size spoons. Reapers and Vulcans made by http://www.badgertackle.com have been working for us. The small silver Vulcan in green or blue has been hot on the downriggers. Run them 50 feet behind the ball 15 feet down to the bottom. Six inch flashers or dodgers with green or blue Howie’s peanut flies also caught fish. Ripped one Chinook on a Slide Diver today. Tie your flies 14.5 inches on 6 inch dodgers, 24 inches for 6 inch flashers. All orange dodgers and flashers. I hope this helps. Lake Trout action was slow today but we didn’t fish there favorite spots. Coho fishing has been spotty. We did find some action in 80 feet off the Filter two days ago on spoons. Fish are hanging in close to shore or the break wall. We did not get out over 50 feet of water yesterday. It can be a zoo in close with all the traffic and it may be better to head out the north gap Milwaukee follow the shoreline working 40 feet of water. Have a great fishing season. Let’s go fishing! Note All alone we put together groups at $125 per person. Jim charters out of Milwaukee, WI. with Blue Max Charters. He can be reached at 414-828-1094 or visit his web site at http://www.bluemaxcharters.com Copyright© 2016, James J. Hirt, All Rights Reserved.